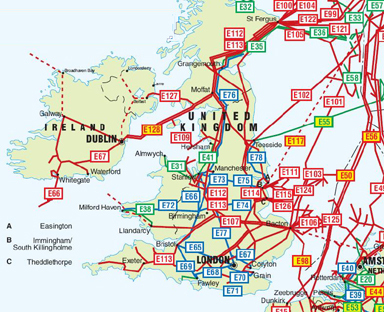 The following table lists pipelines in the United Kingdom (Great Britain) and the Republic of Ireland, including cross-border, international pipelines which originate or end in these countries, as shown on the map. It is followed by a map, which you can click to see an enlarged version. The pipeline routes on the map are labeled with the codes that are explained in the table. Pipeline label codes are colored green for oil, red for gas and blue for products, such as gasoline and ethylene. The diameter, length and capacity of the pipeline, if known, are shown on the table. Follow these links for current United Kingdom economic data, which include oil and natural gas production, consumption, imports and exports and Ireland economic data with the same information. For historical data follow this link and on that page click on a year and then a country name. 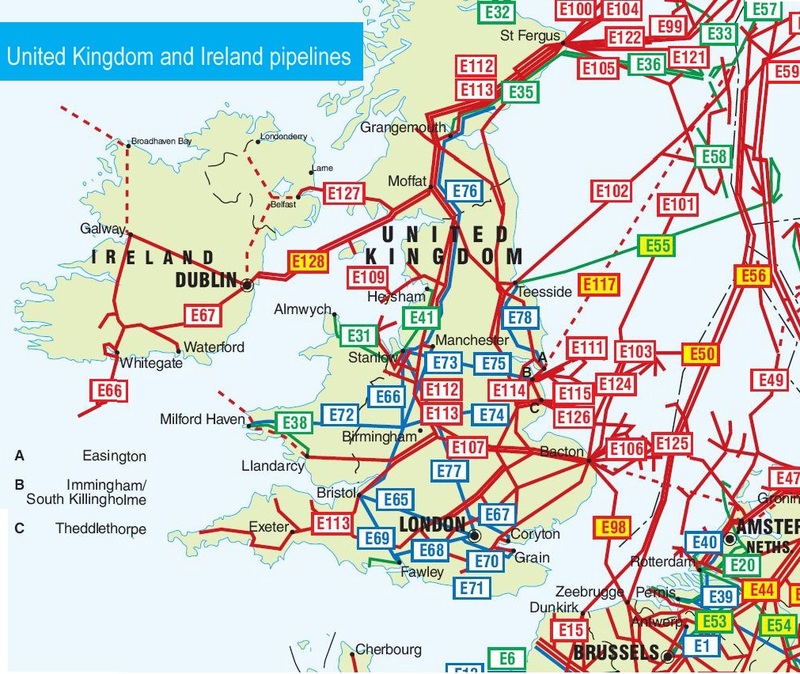 NOTE: The information regarding United Kingdom and Ireland pipelines on this page is re-published from various source. No claims are made regarding the accuracy of United Kingdom and Ireland pipelines contained here. All suggestions for corrections of any errors about United Kingdom and Ireland pipelines should be addressed to the webmaster.